You get a sense of course flow. When you’re looking through a storyboard that is laid out in tables in a document, it’s really hard to get a sense of how the information will flow when you actually click through it. You’ll have a much more “learner-like” experience if you create your storyboard in Storyline and let your team click through the slides, like the learner will. It’s clearer for the developer. When the content is laid out on each slide with clear instructions and notes, it’s much easier for the developer to take the storyboard and bring to life exactly what you envisioned, as opposed to working from a Word document or something less visual. You’ll have less back and forth and revisions to do when you’re content is laid out clearly from the get-go. You save development time. When you build your storyboard directly in Storyline, the shell of your course is already built and most of the content is already there; all that’s left to do is the styling of your content to make it look nice. 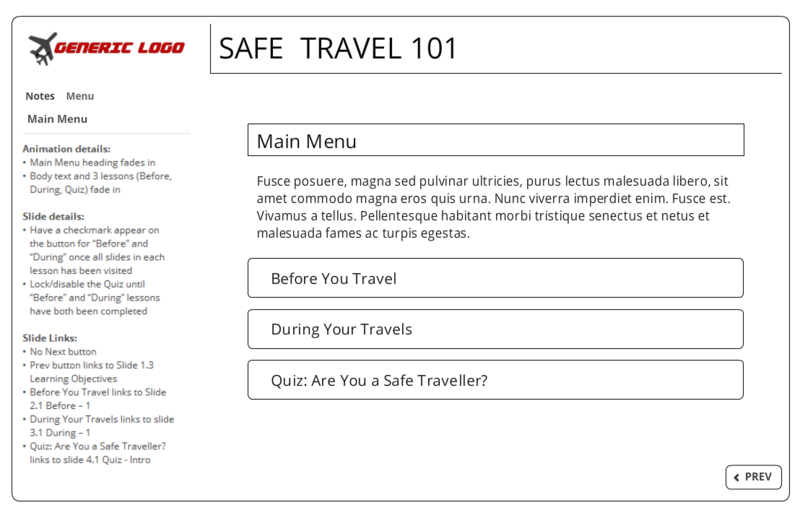 With these benefits in mind, let me share some of the tips and tricks that went into creating this sample storyboard for my Safe Travel module. In order to let the learner “click through” the storyboard, you’ll need to set up all of your hyperlinks in your prototype. This is part of what makes a storyboard in Storyline so helpful and time-saving: getting all of your navigation details and links sorted out from the beginning. You will know exactly what buttons are on each slide, and exactly where everything links. Another tip for building out your navigation: don’t leave the Next and Prev button links to “Jump to next slide” and “Jump to previous slide.” Go through each of those and hyperlink to the actual slide you want the buttons to link to specifically. Your storyboard is intended to get the flow and content just right. You might decide to include images, or only image placeholders, depending on your project’s requirements. But working out the details like background specifics, font style and size, and accent colors can be done later. First and foremost, you should make sure the content is solid and accurate. Make sure it’s clear for those reviewing your storyboard that styling will come later, or they might get hung up on that. My tip is to give everything a simple wireframed look with black and white, and a super-simple default font. This ensures the focus is on the actual slide content, not the styling or look-and-feel. Using the Notes field to include detailed instructions or information for reviewers and developers is a great time-saving tip. The level of detail you include in your notes will vary depending on your requirements, but it’s a good idea to provide any details you can about timing and animations, navigation, specifics about images or graphics, or anything else you want the developer to know or include in the course. The great thing is: once you’ve created your storyboard or functional prototype directly in Storyline, you can simply do a “Save as” of your .STORY file and start developing your course directly from the storyboard. This will save you tons of development time, as your images (or placeholders) and text content are already all included. Simply style your course, add multimedia, and—voila!—your course is complete! Plus, when you storyboard in Storyline, you’ll not only make the development process easier for your developers, you’ll also speed it up. Do you have any tips of your own about storyboarding directly in Storyline? If so, please leave a comment below. HOORAY! Thank you Nicole! I have been doing my storyboarding in SL2! Thanks for this article and these helps! Thanks for the lovely feedback, Sylvia! Thank you for sharing your experience using Storyline to storyboard, Nicole. We currently use Word to storyboard but are exploring other options for this activity. How do you collect feedback from subject matter experts on your Storyline storyboard? Hi Maureen, Articulate 360 has a new tool, Articulate Review, that really helps with collecting feedback from SMEs. You upload your SL project into Review, and can share a link to the project and users can add comments next to each slide in the course. Highly recommend the upgrade! We use Google Slides, and it has been a wonderful game-changer. Not everyone on the team has Storyline installed, so we can't create storyboards there. Slides is helpful for gathering feedback in the design stage. OH that is interesting way to share the documents. What about SCORM cloud? Our company uses Google Apps, so our business partners are used to those tools. Gathering their feedback is hard enough, so we try to use tools that are familiar to them. After the course is published, we use ReviewMyeLearning since we don't have Articulate 360. Thank you for sharing your prototype sample, Nicole! I really like how you've stripped down the player and use the notes section to display the additional storyboard details. I agree storyboarding in Storyline not only saves time during the development phase, but now with Articulate Review gathering feedback on the prototype is SO much easier! Thanks Nicole! Very helpful, especially as deadline looms. Can I ask how you have the Notes Menu displaying on the left side? Is that a feature you set up on the Player? I think it would be helpful for my client to be able to see it there, rather than in the Notes below. Can you point me to how it is done please? Hi Jim - the location of the tabs can be customized in the Player Properties > Features > Player Tabs. You can move the Notes and Menu tabs down to the Sidebar. Hope this helps! Thanks! Its all coming back to me now…. Just thinking – so you have a preferred way to shar the storyboard storyline with a reviewer? I think in the past I published it for web, then had them view the html5 file. Does that sound reasonable? I'm now using Articulate Review, having just upgraded to the 360 suite. Prior to upgrade, I'd upload the published files to the LMS and provide a URL to the reviewer. I like to the idea of using Sl2 for Storyboarding but just like someone asked earlier, how would I share this with someone that doesn't have SL2. (We don't have 360 at this time, and I would much rather use Review for that purpose). I agree with Helena. Most of the time, only the developer has licenced storyline on their computer. It would be difficult to pass it on to others who do not have access to storyline. What about exporting to word/cloud-based documents for them to add their comments to? Combined with a published draft I think this could be the solution for me! That could be a solution :) I'm wondering if that the course flow structure would be the same as what you actually see in storyline? Have you tested it out? I only realised today you can output to word (even though the button has been right in front of me for months!!). It seemed to be perfect for me. I guess this could change if you had a complex branching scenario so it could depend on the course. I guess Articulate review would be ideal in that case (so excited about that product!). Hi Kiran - Yes I understand what you mean about sometimes only the developer will have the Storyline tool installed. 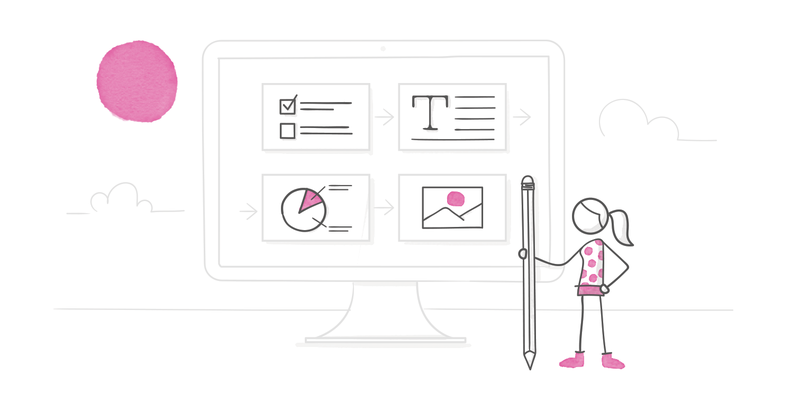 Might you consider Powerpoint for your storyboard? Then it will still have that slide-based format that lets you click through and experience it like a learner will, almost everyone has/and knows how to use powerpoint, AND the developer can simply import your Powerpoint into their version of Storyline and start working directly from that content, saving development time. Someone mentioned using Google pages. Alternative to Word, Google Docs functions much the same way, but everyone can collaborate in a single place instead of having a different file version going to each reviewer. That's a really great tip, Kim! Might also be beneficial to let the SMEs/Reviewers see each others comments so they don't leave duplicates or conflicting comments. I like that idea (hopefully we get 360) but want about confidentiality? Is there a reason you'd take screenshots and import into word, rather than simply publishing to word directly from Storyline? Thanks for sharing this template, I have downloaded and started using. For some reason, I'm having a really hard time getting the Next button to work. I triple checked the settings, but sometimes I have to click next 2-3 times before it will advance to the next slide, or in this case go back to slide 1.2 which is the menu. This is both in preview (project) mode, and published. Do you think it's because there are multiple scenes? I don't typically divide my modules up into scenes and have not experienced this next button issue before. Thoughts? Hi Teri! The reason this is happening is probably because the Menu in the Player is set to "Restricted". What happens when the menu is in this mode is that it doesn't allow a learner to click ahead to the Next slide until the timeline for the slide is completed. If you change the length of the timeline to be 1/4 or 1/2 of a second, or change your menu to be Free, you will probably fix this issue. Hope this helps! Thanks nicole - I ran into that too, and your reply is timely!